Why do the Chinese like to title their movies The Banquet so often? A quick search on IMDB pulled up three entries… out of four total. I know Chinese people love eating and all (I can legitimately say that since I’m Chinese), but still… no one else has had so many films named after a dinner party. The Banquet is one of the latest Chinese martial arts epics to hit American screens, and it is bountiful in both its strengths and its weaknesses. 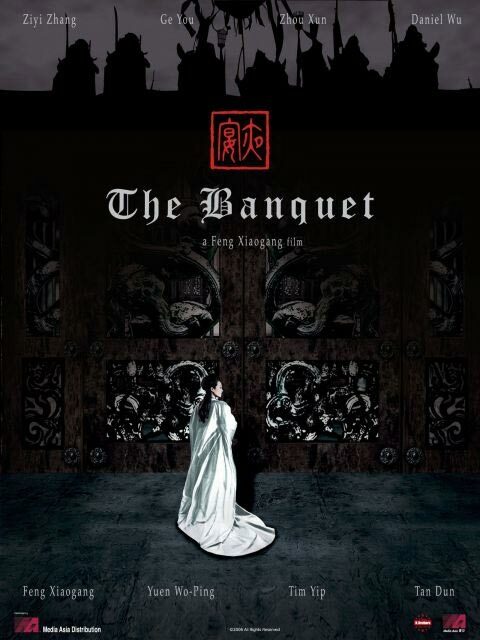 Loosely based off Hamlet, The Banquet is primarily a story of betrayal and unrequited love. To start off, the film looked beautiful during the scenes within the palace. Director Xiaogang Feng utilized flowing robes, an amazing color palette, and excellent costume design to the best of his ability, and artistically extended action scenes with slow motion camera shots. At times, however, the extended shots could have been cut short. By a lot. They seemed to drag on and occasionally made me forget I was watching a “martial arts epic.” It seemed more like I was watching the “Planet Earth” series on the Discovery Channel (or BBC). The only difference was that this time, the chimpanzees were human beings. On the flipside, however, the outdoor scenes were pathetic and lacked charm. They could not live up with the beautiful shots within the palace, and the dichotomy was great since the film switched back and forth between the two locations numerous times. It was almost as if two separate cameras or two separate people were used to shoot the outside versus the inside. The storyline for The Banquet was tragic yet somewhat believable, but it failed to incite emotion. Great Shakespearean tragedies are great because they invoke a sense of injustice and of tragedy that could have been avoided. Although The Banquet did have these elements, the film’s extreme theatrics took the reality right out of it, dulling down the emotion and failing to stir the senses, despite the fact that lovers and ex-lovers were dying left and right. On screen, there was a hefty amount of crying, but in the theatre, crying was nearly non-existent. Probably the best compliment that I can give this movie is that the acting was for once pretty decent. In the recent slew of Chinese martial arts movies, particularly in The Curse Of The Golden Flower, the acting has been absolutely horrendous. I think in Golden Flower, I had a hard time even giving the storyline a chance because the acting was so bad. As a native Chinese speaker, I think that I can probably pick up on bad acting in Chinese films better than the general American audience. It was a relief that the acting in The Banquet was convincing, even if the overall execution of the film was quite poor. All in all, The Banquet is not a bad movie to watch once, simply for the art… and perhaps for one extremely captivating scene towards the end where everyone befalls tragedy at once.